I can’t believe Pearl is EIGHT months old now – it’s crazy, where did the time go? So, today it’s time to write her six and seven month updates. Her first year is going by in the blink of an eye and she is growing and changing every day which is so lovely to watch. 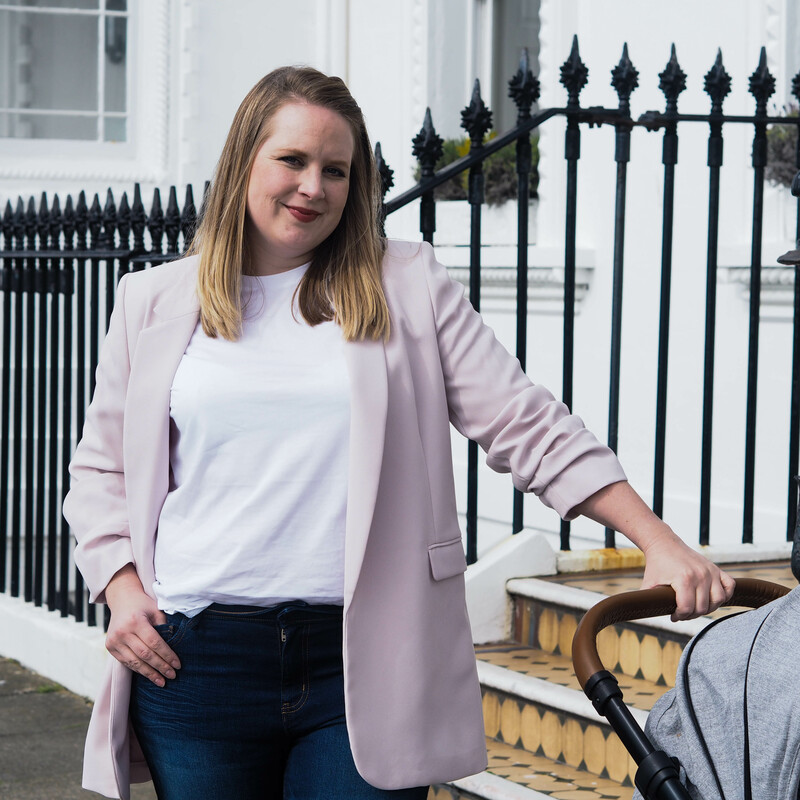 Months six and seven have brought so much change – she is no longer a tiny, helpless newborn but a fully fledged baby – learning all the time and wanting to be more and more independent every day. She is polar opposites to Violet in personality. She’s such a calm and smily girl, she is amazingly easy going and will join in with any situation without a fuss. She rarely cries – if she does you know there is something majorly wrong. She’s a total wriggler, wanting to be on the move from the moment she wakes up to when she sleeps, even in your arms she’ll be kicking her legs, wanting to stand up. We call her our ‘little brute’ as she is so much more boisterous with her movements than Violet ever was. She loves bashing toys together, pulling everything out the toy box and throwing things around. If Violet builds her train set, it’s guaranteed Pearl will pull it all apart in seconds. She loves exploring but will find anything she isn’t meant to have in a room and will tug on your nose or hair given the chance! When it comes to milk, she is now 100% formula fed and is on the HIPP Organic First Milk. In my last update I wrote about some issues with reflux and tummy problems, but those seem to have sorted themselves out now and she’s happy with her milk. She is fully weaning now. We were off to a flying start as she was so excited to join her big sister and eat proper food. She has enjoyed most foods we’ve given her and hasn’t turned her nose up at anything yet- apart from she’s stopped eating baby porridge in the last week or so, preferring Rice Crispies or Ready Brek, which Violet eats. It’s hard to wean a baby on baby food when they have a bigger sibling as they always want what each other have! Apart from Violet never wants Pearl’s food, saying ‘yuck Mummy, that’s for babies’. Her favourite foods so far have been avocado, pasta, rice pudding and chia seed pudding. I made a video of what she eats on a typical day to which you can see here. We had a bit of a set back with weaning a couple of weeks ago when Pearl choked on a piece of toast. It was honestly terrifying and it’s really knocked our confidence when it comes to larger finger foods. Since then we’ve been sticking to smaller or grated foods, still trying to keep texture in there so she learns to chew and swallow properly, but without the risk of choking again. We will work on bigger pieces of food when she has a few more teeth! Pearl has never been a good sleeper and has still not slept through the night. At our best we got her down to one night feed, but as the 8 month sleep regression draws closer, she’s waking more and more in the night again! One day I dream of a night where she sleeps though but I just don’t think it’ll EVER happen! This month we’ve had to decide what to do as she’s growing out of her beloved Snuzpod, but doesn’t like going in her cotbed in her room either. We are trying to introduce her cot by putting her down for naps in there first, but I think it’s going to be slow progress as she hated it and woke nearly immediately! Most nights she’ll sleep for the first few hours in the Snuzpod, then about 11pm come into our bed and sleep there for the night. I really don’t mind this as I enjoy co-sleeping (they are only this little once!) but I think we will need to work on her first few hours being in her proper cot in her room, as she needs a place to sleep before we come to bed! I don’t want to have to get into bed with her at 6:30pm every evening to co-sleep and the Snuzpod is getting way too small. Hopefully we can sort a new plan out soon. Pearl is officially on the move! She is confidently sitting up independently, reaching forward and to the side without toppling over. We went through a phase of having to put cushions all around her but I think those days are over now! At around 7.5 months she’s started crawling. It’s more of a commando crawl but she can cross a room quickly now and often tries to follow me out of the room – I find her in the hallway quite often, which still surprises me! She loves jumping and often bounces in her Jumperoo or door bouncer. If she’s being held she will want to try standing up, I wouldn’t be surprised if she starts trying to pull up soon as she gets so annoyed with just sitting. At around 7 months her first tooth came through, the bottom right tooth. That’s all she has so far! Pearl is definitely in the separation anxiety phase – she will burst into tears if I put her down and leave the room, even if I’m coming back in 5 seconds. She wants to sleep right next to me and generally doesn’t leave my side 24/7. She is increasingly more difficult to photograph, especially holding something, so this is the best we could get with her milestone card photos! The were bent and chewed within seconds. She’s started making more sounds that sound like words – It sounds like she says ‘Hiya!’ all the time and various different words, but I think it’s all babble at this point. She’s really trying though. It’s been a busy couple of months! We’ve been all over the place, from days out to the farm, softplays, Spring Lambing and more! Pearl is able to join in and is showing interest in animals and scenery which is lovely. We’ve been to a couple of Creation Station baby groups, where Pearl created her first artwork. She starts a messy play class on 23rd April, which we are both looking forward to. I always like to take her to a class on a Tuesday as it’s our day to have some quality time together whilst Violet is at nursery. We had a lovely day out in Brighton doing all the tourist hotspots with our Brighton Explorers pass. It was the first day out we’d been out with just Pearl and she loved being the centre of attention, as let’s face it toddlers are ALWAYS the centre of attention. We went on the i360, had lunch and then walked around Brighton Pavilion. I forgot how easy days out are with just one small baby, it was a breeze! Feeding: Formula – Hipp Organic First Milk and weaning onto solids. Currently loving foods that are the stage between purees and proper solids – I’m basically grating everything! She loves pasta, avocado, chia seed pudding and rice pudding. Sleeping: Still not great, waking a lot – about to transition into her own room. So sweet! Time is flying by!